Christina Trevanion and Thomas Plant begin in Gwersyllt in Wrexham, meander through the border counties of north Wales and England, and finish up at their final auction in Stoke. With £200 each, a classic car and a goal - to scour for antiques. and it's your last chance to tell me how much you love me. Christina was bowled over in Ireland. The people are so friendly and so sweet. And Thomas was wowed by Wales. especially as it was made before it was compulsory to fit seatbelts. Both our experts started this trip with £200. Thomas has less than he started with, just £186.14. You are a tiny snifter away from me now. You have held the lead all week. you might just pip me to the post at the very last minute. Their adventure began in Cashel, Tipperary. over 700 miles later in Stoke-on-Trent, Staffordshire. aiming for auction in Stoke-on-Trent. I love your new jumper. Oh, we're matching. Slightly matching. I'm feeling, you know, positively wealthy. Well, I think you should spend it all. -Well, you never know. I might do. -Did you just hit your head? Thomas has his work cut out on this leg. Time to meet the folks in charge. Nice to see you, I'm Thomas. -Carol, nice to see you. -This is my husband, Dennis. -Nice to see you, Thomas. The Prices run this place, full of bygone treasures. This is a shop of shops. If you can't find anything here, there's something wrong with you. and play with it for hours and hours. But at £250, it's slightly out of his price range. There's a number of things in here. I quite like the eclectic mix, what's going on. What I have seen was this cup. It says here, "unusual stone goblet, the Holy Grail." Is this the Holy Grail of the Antiques Road Trip? -It's done in a soapstone. What's it got on there? £32. I think that's brilliant, don't you? -Yes, a bit of weight. Yeah, yeah. Well, I'm super-strong, you see. Probably from a church communion. It's not the only thing he's spotted. It's got this trademark here. Crikey. Where did you get that from?! Put your teddy bear on there. So, there's a label on here which says £35. Sort of like... A tenner? While Carol calls the dealer, Thomas spies something else. and on the goblet are Masonic engraved designs. 50 quid on it, though. -I like this, because it's got a yellow to it. So it sort of dates it, early 20th century, I would have thought. He's got £50 on it. Ooh! I'm sure Roy is open to offers. So where are we with the other items? OK, the chair, the answer is yes on that. Carol's also managed to get the Masonic goblets' owner on the phone. Hi, Roy? I want to make you a cheeky offer. I'd love a two in front of it. Could we deal at 28? -It does. Oh, you're a star. Thank you very much. Well, that's a buy. That's a generous deal, as Masonic items often do well. Now, what about the soapstone goblet? I think I'd be very happy with that. and the Edwardian bamboo chair. in the stunning border county of Flintshire. and there's been a street market here since medieval times. Christina's at her first shop of the day. -Hello! You must be Holly. -I am. Nice to meet you. -Hello, Holly. Lovely to meet you. -Can you show me around? -Absolutely. We'll start in the back room. All right. I love a good backroom! She's rather gorgeous, isn't she? -but she's certainly got a look to her, hasn't she? and it's really hard to find, sort of to find the originals. Sometimes, it's nice just to have a bit of modern. Also, obviously, it's reflected in the price. -And probably at home in my house! She's got 64 on her now. Is there a deal that can be done on that, Holly? I can certainly consider it. You haven't been upstairs yet. We like our weird and wonderful. -That's a pair of stocks! Is it a pair? Is it just...? -I wouldn't want to share it. -Gosh, there's a deterrent if ever I needed it. We could get Thomas in there, and throw sponges at him. -Sounds brilliant! I'll be front of the queue. No, you'd have to beat me to the front of that queue! It's cool. It is cool. We've had it wired so that it can be run off a plug. -It's built to be a pool table light. -It's got that kind of look. Maybe so, but the ticket price is £78. -What did we have on our lady downstairs? I would want to pay £50 for the two. -How are you feeling about that? -Do you want to have a lie down?! -Tell me what you can do for me. I mean, if you can't do that, then that's absolutely understandable. I think if I can squeeze another £10 out of you, I'd be happy. and our lady lamp downstairs, happy at that? So, that £60 for the Art Deco style lamp and a snooker table light. -There we go, darling. 20, 40, 60. That's what we agreed, isn't it? Brilliant. You're a star. just over the border into Cheshire, to the historic city of Chester. but it's also home to the oldest shopping facade in England. were created over 700 years ago. Thomas is here to check out a local gem. Simon, nice to meet you. for the home and garden sourced from around the world. That's a stylish thing, isn't it? but what it really is is a cigar or cigarette lighter. And it's by the famous maker, Dunhill. This would be passed around as the table light. You can see where it has been bashed a bit. I think these evenings can get a little bit raucous. It's going to be a lot of money. But what a cool thing! -It's going to be £200. -Purely because of the name. I didn't even have £200 at the start of the day. More like the start of the week! That is a model from a hat shop. It's for a woman's milliner. Actually, that could be a potential purchase. It could be quite good fun. I quite like the angular lines to her. and could have come from an old department store. Let's talk about the head. The model. Do you think we could do something slightly on the price? -I can help a little. I could do it for £30. I think I'm going to have to go for her. I'll give you £30 for her. £30 for the rather odd rubber mannequin head. I've got to think of a name for her. If you come up with any bright ideas, give me a call. You could always name her after my little pup. Christina's travelled west to Hawarden. one of Britain's most revolutionary Prime Ministers. Christina's come to meet warden Peter Francis. Hello! You must be Peter. Hello, Christina. Welcome to Gladstone's library. but outside politics, his passion was reading. now on display, along with his papers. and what they don't know is he was a voracious reader. He read about 22,000 books in his lifetime. and if you add them up, it comes to 22,000. -That's about a book a day. And most of those have his annotations throughout. a fascinating understanding of the great man. "four days before his death. "his prayer like that of one already released." At peace. Isn't that wonderful? And here's one that's a biography of his great rival, Disraeli. -about the man as well, doesn't it? and his radical views saw great reform in the Victorian era. and introduced a secret ballot. at a time when it was predominantly the rich that were educated. and experienced a famously frosty relationship with the monarch. This was a present from Queen Victoria to Gladstone. -They didn't get on very well. But she gave him a book. -Well, that's a pretty special book. And what's this? Is this some sort of library security measure? No. I mean, it probably functions as that as well! But actually, it's one of Gladstone's axes. and he wondered what he could do. And so, he began to cut down trees. would help him enter into the spirit of this. He seems like quite a diverse character. Gladstone believed reading was key to people bettering themselves. and often lent out his own books. and books who had no readers. Aged 85, he built a sort of corrugated iron hut. -to the corrugated iron hut. -wasn't a suitable place for the great man's books. So this was built as a national memorial to him. and this impressive building was erected soon after. a legacy that has stretched across the pond, too. It was also the model for American presidential libraries. and every president since then has had their own library. But this is the only Prime Ministerial library in the UK. an extraordinary insight into this revolutionary man. A befitting tribute to one of Britain's greatest statesmen. And on that note, it's off to bed. Oh, this is beautiful, isn't it? -I can't believe how well you're driving this van. -Oh, no, here we are, we're going up a hill now. But when we started out, you were hopeless. an Edwardian bamboo chair and a mannequin head. He's now got just over £90 left. Christina spent £60 on two items. so she still has just under £210. And sadly, it's nearly the end of this road trip. This is it! I cannot believe it! It's gone so quickly. It really has gone quickly, hasn't it? Yeah. And we seem to have covered an awful lot of miles together. is known for its beautiful timber buildings and canal network. Here we are. An antique shop. -I'll see you this afternoon. Look at this. Ah, Lister. So, we have got in here a butter churn. churning and churning and churning. It was the most thankless task, churning your butter. Owner Jan Gnatiuk has a passion for old furniture, amongst other things. -Jan, lovely to meet you. What will she spot in here, then? You've got some interesting pictures here. -I think, of sort of military themes. which is propped up with crutches. Looks like something from a pantomime! -I can do it you for a tenner. You should be able to make some money on that. because it's actually in pastel, and it's picked out in white. It's got the pencil date mark on it as well, somewhere. OK, well, that could be a goer. Cor, she works fast! You've only just arrived, Christina. As I'm going to Stoke, I think I'd like to buy some pots. I've got a dinner service which is going cheap. -I've had it for a while. It's in the bottom cupboard in the press. -Have you got things stashed in drawers?! -Always have things stashed in drawers. Oh, go on, show me your drawers, Jan. There are all sorts of things hidden away. I think it's 1960s or 1950s, but it's complete. Oh, my goodness! That's Denby, isn't it? I have sold one of these quite recently. You can have the lot for a fiver. -and its saving grace is, it's quite nice. But it'll take half an hour to wrap it all up! cups, saucers and condiment items to boot. ..and the dinner service, for a tenner? -Do I have to wrap it up now? I'm not wrapping it up! I hate wrapping up! two fabulous lots for just £10. to just outside the old farming village of Goostrey in Cheshire. among the front runners in the golden age of the space race. That's not going to be confusing, is it? No, no, that's very easy. Tim and Tom. Ha-ha! Sir Bernard Lovell was born in 1913.
helping to significantly halt the Nazi campaign by sea. Once the war ended, Lovell's career turned to astronomy. So, what happened then after the war? that he had helped develop, to do some physics. -because it was being chucked down mineshafts. -which was used to look at outer space. became vital to Lovell's future scientific pursuits. would allow him to delve further into the unexplored universe. the largest steerable telescope in the world. it was soon called on for another purpose. suddenly playing a key role in the Cold War. "not to track Sputnik itself, but to track the rocket?" might be something rather more serious, a nuclear warhead. passing over the Lake District at five miles a second. the basis for our current missile defence systems. launched by Russia and America, and in 1966, they made headlines again. What else has it been used for in that golden period of space race? We actually tracked a Russian rocket onto the moon, that landed in 1966. It took the very first pictures of the moon from the moon. sent it back to Earth as a radio signal. -Well, you would, wouldn't you? "one of these newfangled fax machines." Not very many people had them. They put out a call. The Daily Express in London answered the call. and they'd used fax technology, basically, to do it. -of the Daily Express the next day. keeping it at the forefront of cutting-edge science. which are remnants of exploded stars. Every day, we make a new discovery. that we're still yet to understand. That's what makes it so exciting. made him a visionary leader in his field. and hopefully will do well into the future. Christina's made her way to Congleton. but it grew in the 18th century thanks to the textile industry. Christina's come to a former ribbon mill. I've been here before, and I made a friend last time I was here. Eric? Hello, hello, my old friend! Now, last time I was here, you had some really interesting things. So, have you got anything for me this time? Oh, I love your Fry's chocolate sign. but probably best not to risk that lead on one item. -That one's in good condition. -Yes, it was how I got them. -Pair of vintage black coach lamps. these would have gone on the side, wouldn't they? They would have slot in so that you could light your way. They've certainly got some character to them as well. There are two other floors to check out, Christina. Right, what have we got in here? Ooh, this looks good. Quite nice to have a look at a piece of something sparkly, anyway. So, that's really rather sweet. -So, caddy spoons are eternally collectable. And this is quite a sweet one. So you've got the duty mark there. George III, Q 1791. So I think that's quite lovely. but Eric thinks the spoons' dealer might be able to do better. -What did Kate say about a best price on our caddy spoon? and I do like your lanterns downstairs. -How much do you have on your lanterns? -Can you do any better than that? -Oh, yeah. I can do you them for 20. I'd want to be getting them for £15 maximum. -Is that something that you could do? Ooh, look! The centre even has a cafe. That was my very last purchase of the week, so I owe you some money. -There you are, my darling. Five, 10, 15. Cheers. -Yeah. How many have you got? I'll see you back here for some cake. Go and do some shopping. Oh, bossy! The pressure's on Thomas now. He's got just under £90 left to spend. See, I quite like a centre. I really do. There's loads of stuff. And soon enough, Thomas spots something rather interesting. called a death penny or death plaque. God. So he was just a year younger than me. Very nice. I mean, that is an amazing thing. dealer Kate takes care of Thomas. Yes. I notice he's got 55 on it. -Yeah. Do you think there'd be anything to be done on that? While he waits to hear, Thomas is covering all bases. I've got a coffee, because I think I deserve one. but what about that £55 death penny, Thomas? The death plaque is such an emotive thing. And I think there's a profit in there, definitely. so Thomas is having a last look. This is a Victorian jug. It's made probably in Stoke-on-Trent. It's quite good. Sounds OK. There's a little bit of a hairline up there. so this is something you'd give to your lover, "Forget Me Not". Time to find Kate again. Do you think we can do anything on that price? Well, normally, that would be about £25. Yeah, all right. I mean, you know, we could round it up and say 15. 35 would be the very best. That's a handsome £20 discount on the plaque. I'm going to buy them both. and the First World War death plaque. -Wish me luck! And thank you. and a soapstone goblet for £143. a Denby dinner service, and a pair of Victorian carriage lanterns. I certainly won't forget him. in the form of a beautiful woman. The Masonic goblet, again, very, very, very savvy buy. There's going to be a good market for that. All in all, I think Christina's got a chance to make a profit. is the snooker table light. Secretly, I'm a little bit nervous! finishing up in Stoke-on-Trent, Staffordshire. -It is a beautiful day. And I'm so happy. But I'm also sad. I feel inside at leaving you. Bravely smiling on the outside! No, I'm almost externally crying as well. was formed in the early 20th century of six neighbouring towns. -I'm going to be very sad at the end of this. I'm going to miss our van. Sun shines on the righteous, Thomas. who's been running ASH Auctions for over 20 years. We've had interest in quite a number of the items, to be honest. plus commission bids come in on that item. The thing that most interests me, really, is the death plaque. Usually those things go well. My least favourite lot, really, is the jug. I would think that one might struggle. It's the final auction of the week. First up is Christina's Denby dinner service. Quite a lot of interest in this. Quite a lot of interest! We've got two or three commission bids. We've also got a telephone bid. And a phone bid! I don't believe it. All the lot. Start the bidding. -I've got £26 straight in. On the phone at 32 for the Denby. Wonderful, Christina. Well done, you. A fantastic profit to start things off, Christina. Thomas' early Victorian jug is up next. Nice jug there. Do I have a fiver? I've got six, I've got seven, seven bid. Eight. Eight bid now, nine, nine bid now, ten. Go on, go on, go on! At £12. Commission winner, at £12, going. and only a small loss. Forget you not. Forget the jug! Let's hope Thomas does better with his Masonic glass. I've got £30 bid. Straight onto commissions at 30 bid now. Take five if you like. At 32, I'll take, then. At £30. If not, I'm going to sell it to the commission buyer. At £30, only bid at £30, and all done. -Thomas, I'm disappointed. It should have made more. It made a £2 profit. -Don't be glum on me. Back with Christina and her pair of Victorian carriage lamps. Can I see £50 to get on? £50 to get on? £40. For the two, this is. £20 for the two. Ten, then, somebody. 12. Is that a bid? On my right. 12. 12 bid. 14. 14. Here we go. 16, 18. 18, 20. 20, 22. 26. Where's eight? Now I'm going to sell. Another decent profit for Christina. I'm finding my feet now. I think that's a brilliant result. and Edwardian bamboo teddy's chair. Bit random, but let's see how it goes. £15 commission bid, straight in now at 15. Looking for 16. If not, I'll sell. ..at 16, I'm going to sell it. -That was pretty quick, wasn't it? to wow the auction-goers of Stoke with, though. -If I hadn't bought the head, that would have been a profit. with her Art Deco-style lamp? 20 bid, straight in at 20. At £20 bid, where? Two. On the second row, you're all out now. Being sold. I'm going to receive it at 40. Can this soapstone goblet make Thomas some money? £20. £10, bid me, somebody? Who's going to bid me? Ten, I'm bid on my right. At ten bid, we're off now. At ten bid. Where's 12 short? It's got to be worth more than this. -What did you pay for this? 25? £10 only. You got a chance. You're going to lose it. Shame. But maybe he's saving his best for last. It'll be fine, Thomas. It will be fine. I think I would have bought slightly differently. Too late for that now, Thomas. We're back with Christina again for the snooker table light trio. Not much we can do without lights. Come on. £30. Not going to make any money. 35 now. Five. 25, 30. -It's not going to make any money. -It's going to make it. -It's going to make £40! but it gives Thomas a chance to catch up. the Marcel Pic charcoal sketch. £20. 15 for it? Come on. Give me ten. £10. £10? Where are we? We've got a bid of ten. I think people think it's a print, but it's not. No, you said it's a sketch. Well we've got a... Yeah, got a bid. 12 bid. At 12, now 14. -Is that the last item of our road trip? -Well, it's making a profit. She's almost tripled her money on that last item. Great stuff. -Are you crying? Are you crying because this is it? that you've got your pocket square. But now, it's Thomas' World War I death plaque. and could be just what Thomas needs to take Christina's Road Trip crown. We've got loads and loads of commission bids. £40 bid, straight in at £40. 75. We got £70 commission. All commission bids are now out. In the room at £85. Where's 90? I'm going to sell it. What an incredible finish for Thomas. But has he done enough? Thomas began this leg with £186.14. Christina kicked off with £269.07. After a great auction, she's made £39.64. making her this week's queen of the Road Trip. -I need to drive you. Because you've again annihilated me. -Did I win this auction? -You did! You've done it. -So does that mean I get chauffeured? -You get chauffeured by moi. Oh, my goodness! How spoilt! That's it for these two, and what a week, eh? I don't want to go back to the United Kingdom. It comes with a free squeak. This could be my lucky day. Luckily, Thomas' driving has improved. Go on, go on, go on. You can do it! You can do it! -Third's easy. Third is easy. But they've had a blast. Probably really ought to start doing some more shopping, hadn't I? Next time: A brand-new pair hit the road. Charlie Ross is doing everything he can to reach new heights. But James Braxton has a secret weapon up his sleeve. 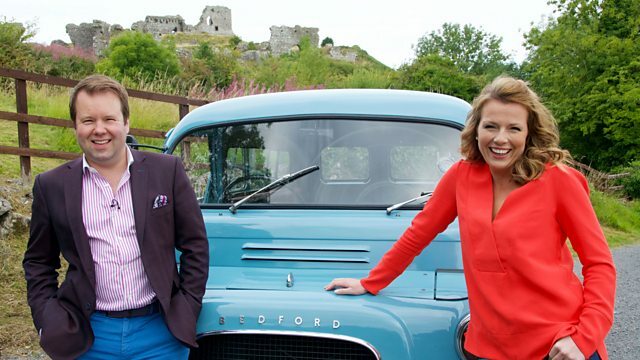 In the final leg of their road trip, Christina Trevanion and Thomas Plant begin in Gwersyllt in Wrexham, meander through the border counties of north Wales and England, and finish up at their final auction in Stoke-on-Trent, Staffordshire.